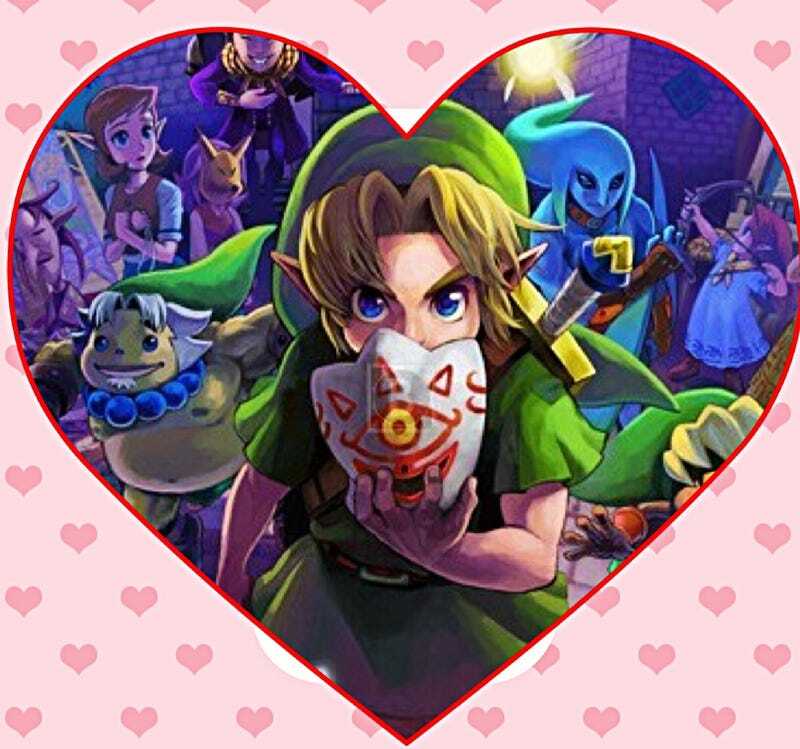 The Legend of Zelda: Majora's Mask had a lot of loving coming to it this Valentine's Day. So much love, in fact, that many a suitor and forlorn caller left empty-handed and feeling a bit jilted. Of course, I'm referring to the debacle that followed the announcements of the Legend of Zelda: Majora's Mask Limited Edition bundle and the Majora's Mask Edition New 3ds XL back in January. Broken hearts lie on the bloody battlefield of the open market. Wrongs and injustices have occurred. As far as The Legend of Zelda is concerned, many of us have had a pretty disappointing V-Day. This article is for you, in the hopes that our spirits may be rekindled and our desire not burn out. Browsing around on the Internet, you'll find a lot of bitter resentment toward Nintendo for their marketing practices. Dig deeper, and you'll find that those same feelings are going around about Gamestop, Best Buy, and Target for not honoring their stock, not promoting on-sale times, and not placing stricter rules protecting the limited quantities from scalpers. And then there are the scalpers, the bottom-feeders of the capitalistic world, the candy-stealers, con-artists, loathsome self-righteous souls who don't mind making an extra buck off of the burning hearts of the fans. Can you tell where I lay my blame? But this is not a letter of blame, or of hate. This is a love letter. After all, it's love that has driven this frenzy and set the world alight for a dedicated group of fans, and I want to focus mostly on that love. But love comes with a cautionary tale, least it turn into obsession, or even worse into Dragon Sickness. That's right, Dragon Sickness, that same madness that affected Thorin Oakenshield after retaking Esgaroth. I know many of you know what I am talking about. You've felt it. At least, I know that I have truly gone mad this past month. I will have to answer in the afterlife for what I've done to attain one of these gems and add it to my horde. And what for? What is that I hope to gain? To answer that question, we have to talk about the object of our lust, our long-time flame Majora's Mask. I became infatuated the moment I laid eyes on the first screenshots in an issue of Electronic Gaming Monthly in the magazine aisle of a Winn Dixie. It was all in the timing, really. It was 1999. I had just been reintroduced to the Zelda series through a used copy of Ocarina of Time I bought months before. I was young, impressionable, pre-pubescent and optimistic. I still believed that there was a hidden way to find the Triforce in Hyrule. What I fool I had been. But beyond gullibility I knew for certain that I was in love with this new world going then by the name of Zelda: Gaiden. I had gone back by that point and played the other Zelda games before OoT, but nothing seemed to capture the magic and character of the 64 title. In a way, I was kind of chasing an ex-girlfriend. This new one looked just like my first, but a little brighter and little more colorful. It also had a lot more mystery, and that was just titillating. A few days later I was putting my $10 allowance down for a preorder at EB Games. It might be possible that this is the story for a lot of you. We're grown up now, but we still haven't forgotten that romp through the land of Termina all those years ago. Part of Nintendo's underestimating of the fervor for this remake might be due to not taking this one fact into consideration. Majora's Mask takes us back to a pretty wonderful time in our lives when Zelda still felt pretty new to a lot of us. This re-release has brought up a lot of those old feelings again. But as is the case with young love, there's always competition. In this case, it has not only been the heat of well-meaning fans, but the relentlessness of vacuous and predatory scalpers. Between these warring factions, retailers were selling out in minutes. Soon obsession set in. Units began to sell for double, even triple their original value on Ebay. Angry posts began to appear across the Net. Love was quickly turning in to hate. I have been most guilty of this obsession. The obsession over this old love became so bad that I began to ignore the love I have now: my loving, and very pregnant wife. I spent hours refreshing Jason Schreier's page on Kotaku looking for updates on when and where the special edition 3DS would be sold, ready to leap at a moment's notice at any change, half-heartedly listening to the love lying balled up in a pitiful lump of blankets and prenatal agony next to me. I passed the floor calling every Gamestop in town as she buried her head in the toilet. I left her moaning alone to speed down the highway on a rainy day, no thinking of health, home, or happiness, just lusting and not caring to fight it. I should have stayed with her, should have held her hair from her face, helped clean her and feed her. I should have been thinking of nourishing her and our baby. The money I'm spending on toys could be going to my kid's college savings, or to a fund that could send us traveling on adventures across the world. Even now, I keep checking the door to see if UPS has dropped off a package and writing a love letter to Majora's Mask when I should be spending what is, in the grand scale of things, truly limited time with the person that is dearest to my heart. I should be thinking of now and the future, but I'm stuck in faded, long ago love. Valentine's Day has now come and gone. Majora's Mask 3DS is on the shelves, but there are a lot of broken hearts still on the bloody field. It hurts me to think that one of those broken hearts could have been my own wife's, and not from a long-ago love, not by the hand of some grubby scalper, but from me. She painted me the most incredible picture for Valentine's Day. Two foxes sit nestled in a den together. She tells me that there is no other fox she'd rather be stuck in a den with. I'm way too lucky she feels that way. In the end, that piece of paper was the best thing I got this weekend. I didn't have to stand in line in the cold for hours for it. I didn't have to give myself headaches from the computer screen staring at it. I didn't have to do anything for it. I got it because someone loves me, and that's worth way more to me than any special edition. So if you're feeling a little broken hearted and empty-handed this Valentine's Day weekend, look to those close to you: your friends, your family, your spouse, whoever. And don't give in to scalpers online. It only encourages them.